Model TF56-N is a precision turbidity sensor for use in various industries. The sensor is designed for inline operation and provides accurate concentration measurements with remarkable repeatability, linearity and resolution. 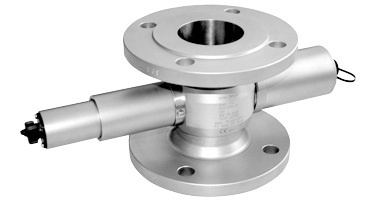 Modular construction of the sensor offers maximum flexibility in adapting to various process needs. Options include electro-polished sensor bodies, chemical resistant materials, (sapphire windows, titanium, Hastelloy, etc.) and high temperature or high pressure versions. Light scattered from particles (trace suspended solids, undissolved liquids or gas bubbles) in the medium is detected by four hermetically sealed silicon photodiodes at an angle of 11°. At the same time, the unscattered light is detected by a reference photodiode. This unique dual channel design compensates for disturbances of the carrier medium. The sensor can be calibrated in ppm (DE), EBC or FTU and measures extremely low particle sizes and concentrations. Special optical windows are made from a single crystal sapphire, providing superior resistance to all abrasive and corrosive media. With the appropriate choice of sensor bodies and a broad variety of line sizes available, the TF56 can be easily adapted to the process. Pressure and temperature ratings specified herein may be subject to limitations - see instruction manual. The appropriate choice of material for all wetted parts is the sole responsibility of the user. Data given are subject to changes without prior notice.